The Habitat ReStore at 31 Meadow Road will soon be selling Guatemalan roast coffee from Dynamite Roasting Co. – by the cup and the bag. Other area retailers will also sell the bagged coffee, which will be available in mid-late November, just in time for holiday gift giving. "Our farmer friends work so hard to provide us with coffee crops of exceptional quality. When they and their families are healthy, communities grow stronger in their region- and in ours. A healthy farmer makes the world healthier in countless ways. This partnership between Dynamite Roasting Co. and Habitat for Humanity is direct action with immediate results. We are thrilled to put this positive plan into motion,” said Josh Gibbs, co-owner Dynamite Roasting Co.
Makenzie Brown, Habitat Guatemala Donor Relations Officer added, “We are grateful for our partnership with Asheville Area Habitat for Humanity. 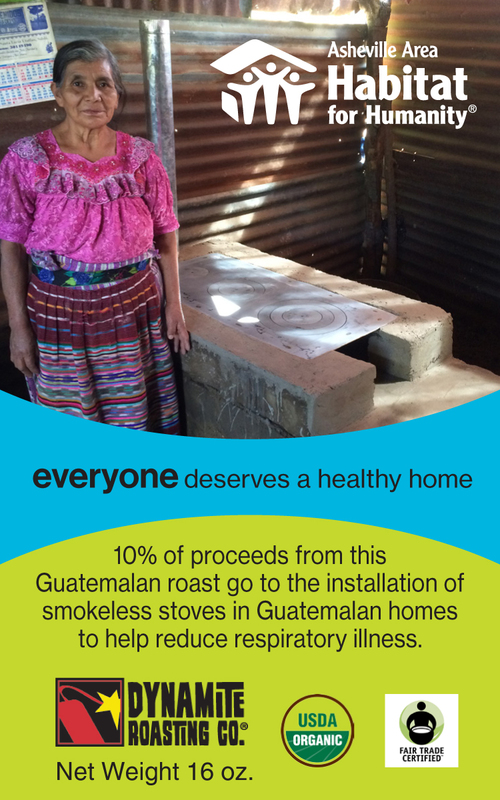 It is because of such support that we are able to work alongside Guatemalan families, and together, improve their quality of life.